The image below was taken in summer 1967 high in the Cascade Mountains at Paradise Inn on 14,000 foot Mt. Rainier. Already the penchant toward originality shines out. Shown are founder Murray Pletz on the left and his cousin Skip Yowell on the right. Murray wryly remarked that of course it was most likely Jan Lewis who took the picture, "Who else would it have been!" which was a reference to how tiny the company really was! The pack displays one of their iconic fabrics, the American-flag material...The label in this picture is the original company label, drawn by hand by Murray... Hallmarks of that earliest label include-- "the snowcapped mountain," the company name is spelled like Jan Lewis' name, as two separate words with each half capitalized; finally, the company's city of origin is shown "Seattle," the company's base. For a recent picture of Mr. Yowell, please see page bottom. The oft-told tale about the origin of the "JanSport" company name is this: Murray was an industrial design student and designed a backpack that used aluminum in its flexible frame. His girlfriend Jan Lewis helped with the sewing portions of the project such as the packbag. Murray bought her the sewing machine used for the sewing in January of 1966 for $180. 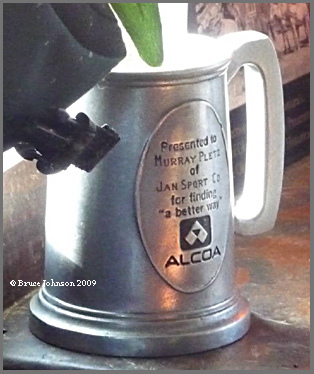 Then Murray entered their finished pack in a design contest sponsored by the Alcoa aluminum company and won the prize (mug picture compliments of Mr. Pletz). Using the contest award as "seed" money, he and his father Norman Pletz formed a company on a shoestring budget, and about 1970 his cousin Skip Yowell joined the company. The origin story also famously includes a marriage! It's told that early-on Murray made Jan an offer she couldn't refuse-- to name the company after her, AND to marry her if she'd join up and sew for him! (so Jan sewed and Murray did marry her, and the fledgling company was given a home above a Seattle transmission shop (Northwest Parts Rebuilders) that was owned by Murray's very supportive father Norman Pletz. Norman was a machinist with the needed tools to cast and form metal parts such as the pack frames).... Sidenote: Trapper Nelson pack boards, 1922: more than 40 years before JanSport, Seattle saw Lloyd Nelson, a local inventer, create what was for its time a major new innovation in packs, the Trapper Nelson Indian pack board. Jan Lewis in 2000 was the Director of Development for the VF-owner Company. In 2005 she retired to the Seattle area, where Murray also now lives. JanSport is currently another of the VF Corporation holdings, along with North Face and many other outdoor and clothing big names. 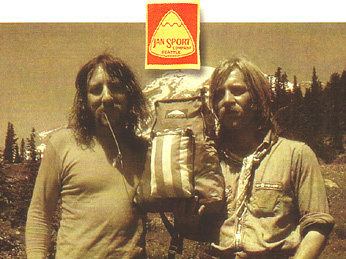 JanSports' early catalogs were marked by a very fresh and personal approach. A favorite of the fledgling company was cover photography which featured one or more of the founders and their modern gear artfully pasted into historical photographs. Often the images seemed to be from the Alaskan pioneering era. 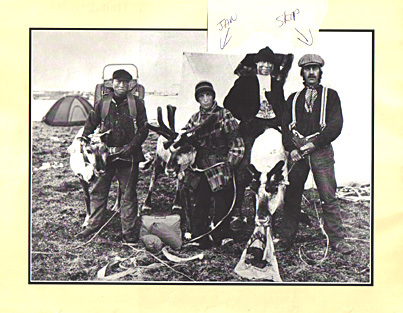 In the 1980 catalog, for example, we find Jan and Skip having fun in an imaginary historical setting with reindeer herders of the Far North! JanSports' catalogs also fequently feature extremely high quality photography* showing products being worn by the founders and various employees. Images of the models in the 1979 "Cross Country" and the 1980 Main catalog in particular seem to me to be portrait-quality, and can still be enjoyed as artful representations of the young people and culture of the Time. 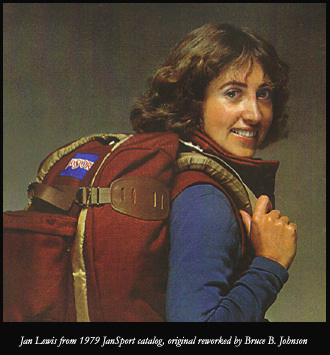 The image of Jan Lewis near page top was taken from the 1979 "Cross Country" catalog. She was was unnamed and merely advertising one of the company's packs. 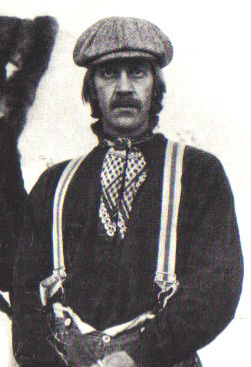 The same was true even for famous mountain-climber Lou Whittaker, for example in the Fall-Winter 1977-78 catalog, pg. 15, where he appears wearing a frame pack but unnamed. (* David Imanaka furnished this information about the talent behind such wonderful artsy catalogs as shown above: Product Photos: Todd Pearson and Robert Milner; Oldtime photo components: Marsha Burns and Michaels Burns; Airbrush work on oldtime photos: Al Dogget; Art Director (1977-1985) David Imanaka). 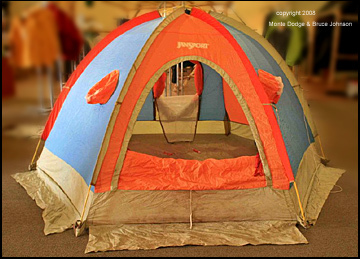 The Jansport Mountain Dome is certainly a notable innovation within the History of Gear. It was designed by Murray and marketed by the company in about 1971 and became very popular, some say even an Industry Standard...... However, Geodesic dome tents were to revolutionize things about four years later (click to see first geodesic tents).... Below is a picture of Monte Dodge's classic version of the JS Mountain Dome-- the 1975 "K2 Expedition Mountain Dome." K2 of course is the second highest mountain in the world, and this JS dome had several added features to make it rugged enough for severe Himalayan snow and wind storms. Packs: Jansport's initial entry into business was as a result of Murray winning an important design contest with a flexible frame pack design, and this innovation continued in the arena of framed packs. Some regard the Alpine Phantom as one of the pinnacles of flexible frame packs ever made (picture will be posted soon).. On a more prosaic level, Jansport early in its course recognized the need for better packs for students, and has made quite a niche for itself in this area ever since, right up to the present. Students all over the World are proud to be seen wearing their Jansport book packs! Shown is the Jansport "Brass Bed" series, which featured down tops paired with Polarguard bottoms. This unusual design was meant to maximize the powers of down, while minimizing down's two main weaknesses-- compressibility under body weight, and poor performance when wet or damp...some liked this design and some did not... I personally owned one for awhile, and eventually sold it because it was far bulkier than an all-down bag. 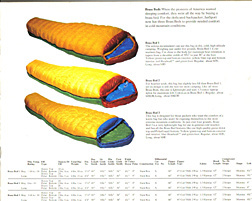 I also found that while the Polarguard bottom was good for summer camping, for sleeping on snow it was not enough insulation, and one still had to carry a separate sleeping pad or suffer a night of poor sleeping-- "warm on top, and chilly on the bottom." 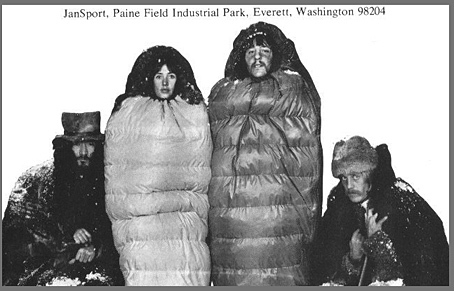 Murray comments about the circa 1978 catalog picture below: "I am in the photo you attached, as the person in the Brass Bed sleeping bag, while Jan is next to me in the Burley Boy sleeping bag. Phersumba Sherpa, nephew of Ghombu, is to her right, and Skip to my left [crouching]." Of great interest-- Skip Yowell released his long-awaited book about Jansport and his life in January 2007. The title is typically JanSport-like in its flair: "The Hippie Guide to Climbing the Coroporate Ladder & Other Mountains: How JanSport Makes It Happen." Friends who have read it say that it's a good read and illuminating. Meanwhile, Skip's cousin and company founder Murray McCory (Pletz) still resides in the State of Washington, Puget Sound area. In the image to the left, we see Mr. Yowell in 2007 (he's on the right). 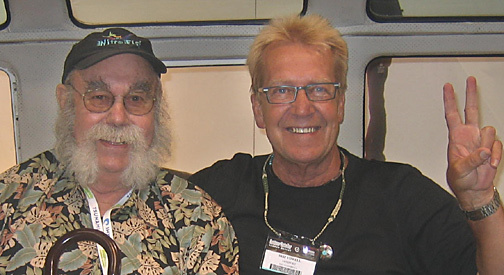 He is in the company of his old friend and fellow gear-pioneer George Marks, who was the co-founder of Sierra Designs (along with Bob Swanson). This image is courtesy of Mr. Marks (who is the man on the left). SAD NEWS: Mr. Yowell passed away on October 19, 2015. The cause was lung cancer. He was 69 years old. Yowell retired in 2010 as JanSport's vice president of global public relations. However, he made appearances for the company until January of 2015. His cousin and company founder Murray Pletz had left JanSport in 1982 while Murray's ex-wife Jan Lewis retired in 2005 to the Seattle area. Not a company to rest on its laurels, JanSport introduced a line of packs like no others ever seen in the History of Gear. These packs are manufactured pre-wired for the iPOD, and are named the "LiveWire" series. I was sent one to test, and ended up using it as a photographer's kit bag, for which it seemed comfortable and well-suited. ..
Main Page: Essays and pictures about the Pioneers of the Outdoor Gear Revolution, 1935-The Present, 45+ pages, five books published, and still growing!